Debutant Ben Foakes was the star as England fought back from an awful start on the first day of the first Test in Galle. The Surrey wicket-keeper - a late addition to the touring party following Jonny Bairstow’s football-induced sprained ankle last week - hit a composed unbeaten 87 to guide his side to 321-8 at the close of play. The situation was much different when the 25-year-old strode to the crease for his international bow however, the tourists five wickets down for only 103 runs scored and staring down the barrel of an embarrassing first-innings score having elected to bat. Foakes shared key partnerships of 61, 88 and 54 with Jos Buttler, Sam Curran and Adil Rashid respectively as the lower order fought to make up for their higher-order colleagues’ failures. Opener Keaton Jennings looked tidy for his 46, sweeping both conventionally and in reverse to reach his highest score since his summer recall before cutting a delivery that was too straight and edging onto his leg stump. Moeen Ali, retaining his position at number three, was bowled by the next delivery following Burns’ dismissal, and although captain Joe Root made a quickfire 35 in a partnership of 62 with Jennings he yorked himself when advancing to Rangana Herath. 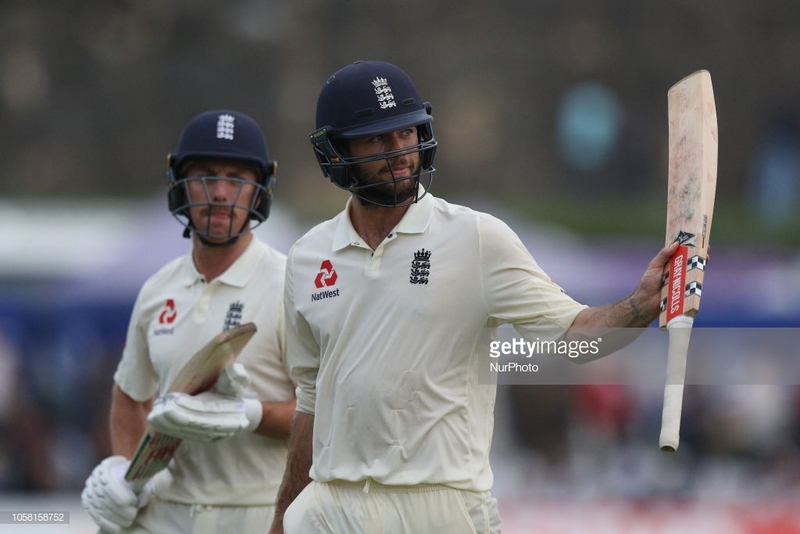 Root’s pre-match call for his men to be bolder and more courageous with bat in hand clearly persuaded the Yorkshireman to wield the willow himself, frequently coming down the pitch and looking to get on top of the Sri Lankan bowlers. When Ben Stokes was clean bowled around his legs having attempted to sweep a ball from off-spinner Dilruwan Perera the visitors were in deep trouble, and are indebted to Foakes and company for taking them to a respectable score. The lower order batted with maturity and composure beyond their experience, playing the spinning ball tidily but looking to attack when the delivery called for it. Foakes played off his pads impressively as he worked the spinners around, content to pick up ones and twos as opposed to continuously looking for the boundary, and was assured enough to confidently use his feet to get to the pitch of the ball regularly and negate any spin. All-rounder Curran carried on from his impressive summer series against India as he dispatched three huge sixes off the spinner in his lively knock of 48 before being caught at slip from the mystery spin of Akila Dananjaya, whilst Rashid continued the momentum in his 38-ball 35. With the wicket appearing helpful for batting, England will hope to capitalise as much as they can with their last two wickets.